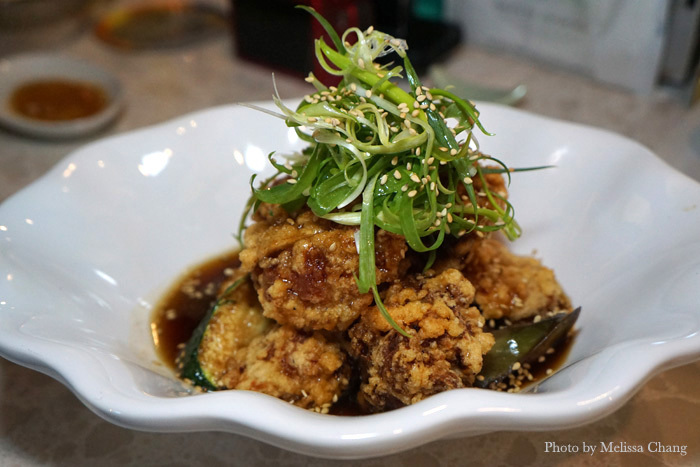 There’s been a lot of buzz about a new izakaya in McCully, and with good reason. This place is craveable, and as my friend Brandon Suyeoka says, it’s at Gaku’s calibre — soon you may have a hard time getting a seat. 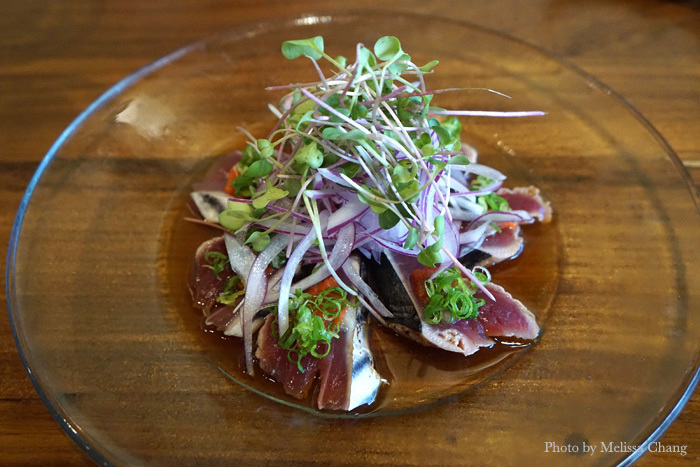 It opened about a month ago on the second floor of McCully Shopping Center by owner/chef Katsuhisa Hoshi, who was previously at Imanas Tei and Nobu. As with any new business owner, going on your own can be stressful, but Hoshi is able to operate happily, knowing he has a good team around him. 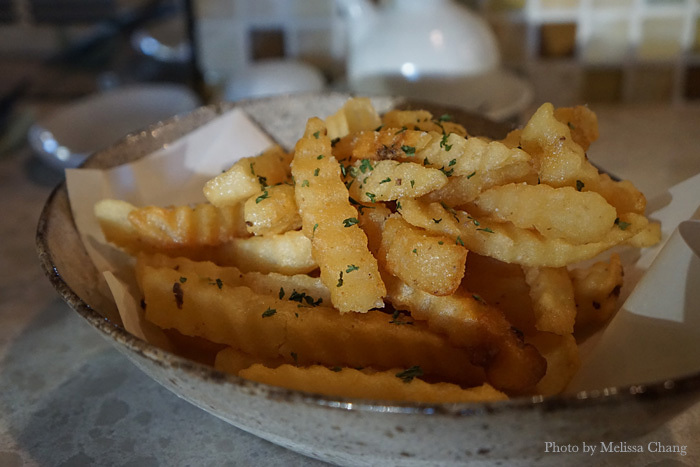 Although items seem familiar, most actually aren’t — I don’t think I’ve eaten many of the things we had at any Honolulu restaurants. Pretty much if it’s a Bozu special, you know it’s going to be good, so expand your horizons and try something new. I think you’ll be as pleasantly surprised, as we were, and want to go back again, as we do. We loved the cold chawanmushi. If you’ve never had this, it’s usually a steamed egg custard in a cup or bowl, with savory bits of chicken and/or vegetables, according to the chef’s style. 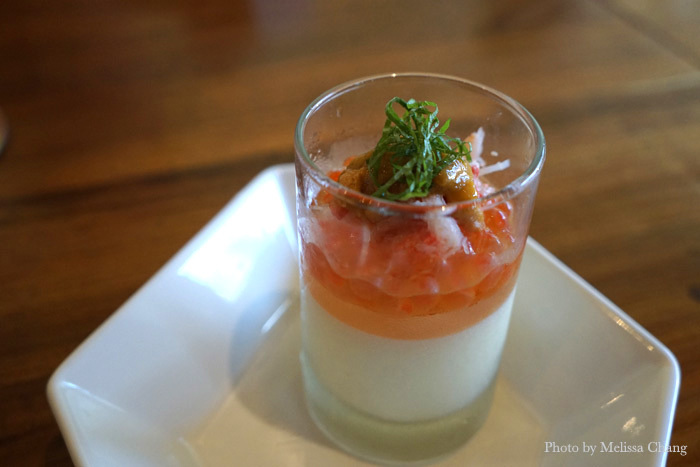 Here, it’s a refreshing cup of custard topped with ikura, uni, crab and shiso. Bozu’s original potato salad, $6.50. I hardly eat potato salad because I rarely find any that stand up to my mom’s. 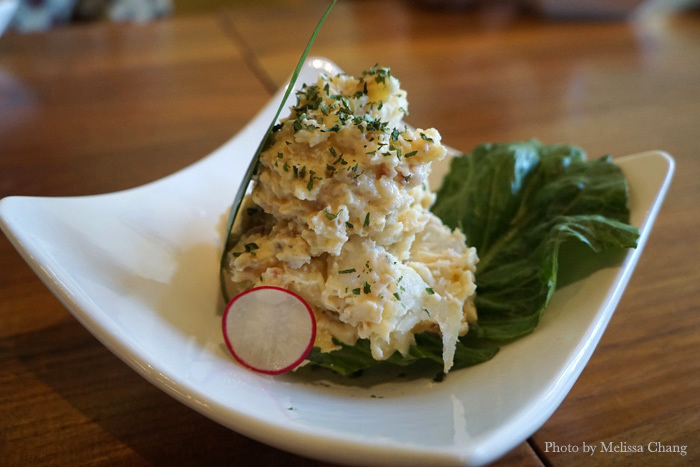 Bozu’s potato salad is not like my mom’s, but is good in its own right, with the right amount of mayonnaise and seasoning and — best of all — bits of smoky bacon. This is pretty addicting. 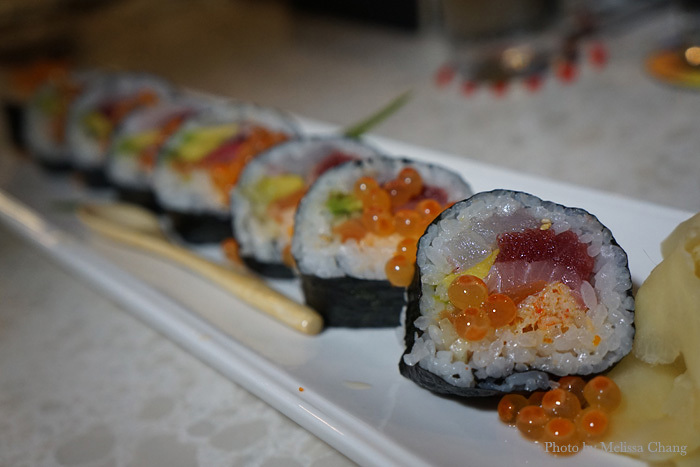 The Bozu special roll is very decadent, stuffed with tuna, yellowtail, whitefish, salmon, crab, shrimp, masago, cucumber, and avocado, topped with dollops of ikura. It’s definitely a little splurgy but quite worth it. We loved the cucumber roll, of which you’ve seen variations at other restaurants. What’s not to love? 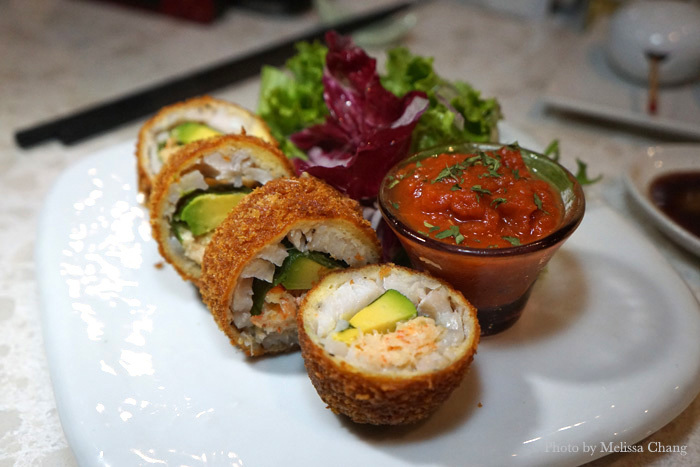 It’s low-carb, fresh, flavorful and delicious, with tuna, yellowtail, whitefish, salmon, crab and avocado wrapped in thinly sliced cucumber. Actually, now that I think about it, it’s the low-carb version of the Bozu roll without fish eggs, isn’t it? Yam and sea urchin beef roll, $14.50 (for three pieces). You’ll probably see a lot of photos of this dish floating around instagram, and with good reason. 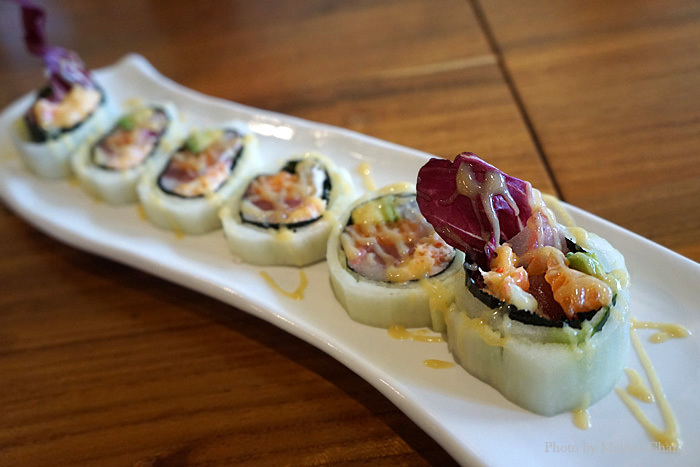 The yam and sea urchin beef roll is a pretty decadent bite of surf and turf. 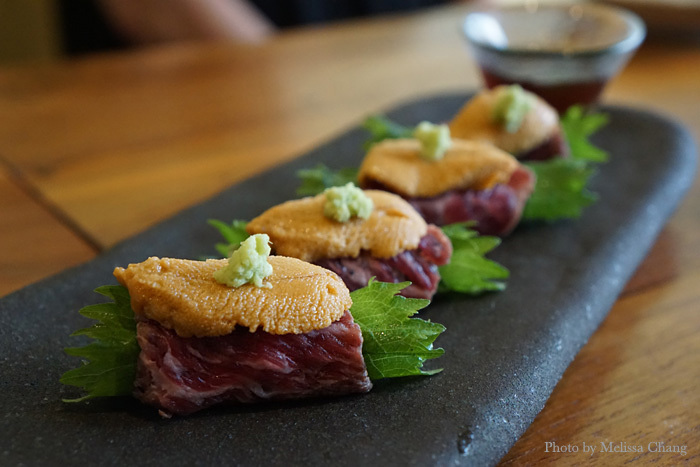 Cylinders of yam are wrapped in shiso, then thin slices of lightly marbled beef sashimi, and topped with fresh uni and a small grating of wasabi. Pour some of the shoyu over and enjoy. Fried potato with anchovy flavor, $7. I’m not sure what to make of these fries. I didn’t taste any anchovy, but others got very fishy bites. You can probably pass on these for more Japanese food. Bozu original fried chicken with eggplant, $9.50. Hoshi describes the fried chicken as karaage with “Chinese style sauce.” It’s moist pieces of boneless chicken, and slices of eggplant and zucchini, fried and then topped with hot shoyu-oil sauce, like what you’d drizzle over a nice steamed fish. It’s topped with a mountain of shredded green onion. And it’s delicious. Crab mayo wrapped in fried whitefish with spicy tomato sauce, $13.50. The crab mayo with whitefish was kind of unique, especially with the spicy tomato sauce. It sounds really weird, but it’s actually pretty good. Compared to the other stuff on the menu, though, it’s not as outstanding. 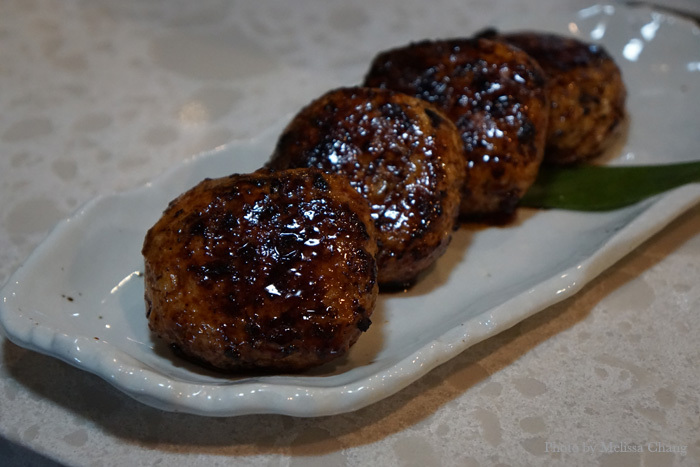 The tsukune are nice-sized chicken sausage patties, steaming hot. 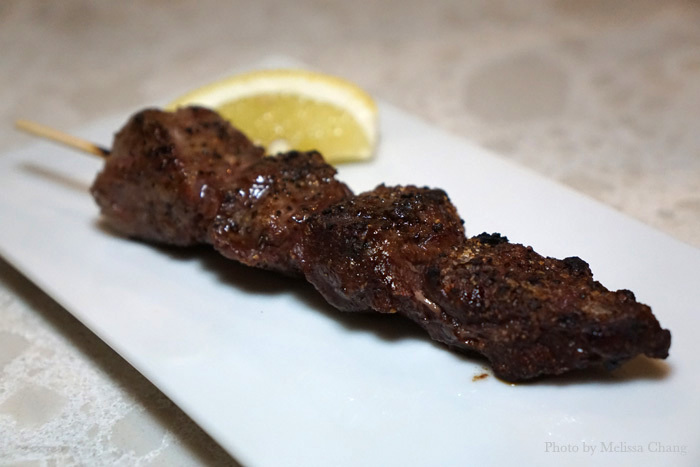 You can get it with salt or tare, but we were told tare is the only way to go for tsukune. This is good for helping to fill you up if you are a big eater. Black pork tontoro amiyaki, $8. 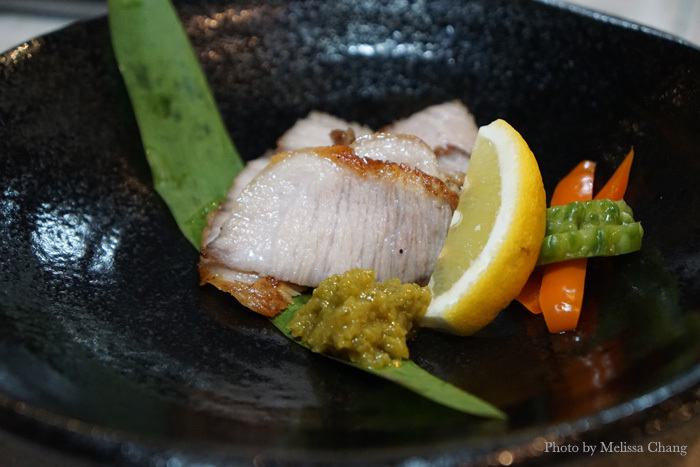 We were bowled over by the black pork tontoro amiyaki special, which was tender, juicy and flavorful. The complex, spicy yuzukosho was what made it addicting. Black pork cheek meat kushiyaki, $3.50. As you can see above and below, the stuff on a stick isn’t pretty. But despite how my pictures look, you should get some. The pork cheek was hearty but tender, full of savory goodness. 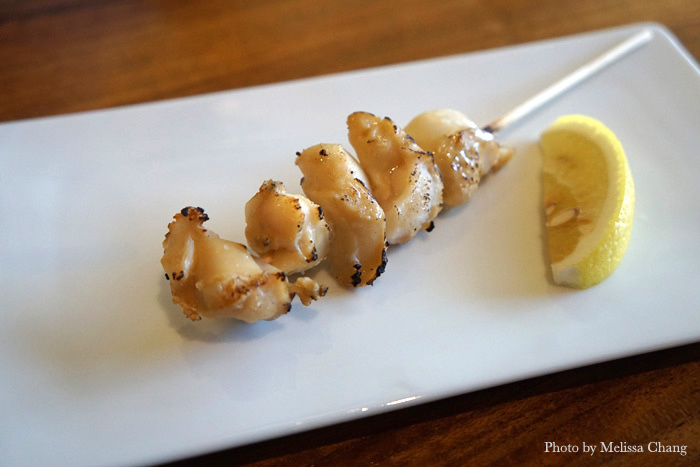 The mirugai (clam) kushiyaki was also nice, a very simple bite of the ocean. I wasn’t a big fan of the aku tataki, as the fish was too strong and oily for me. If you like that kind of fish, this is for you. 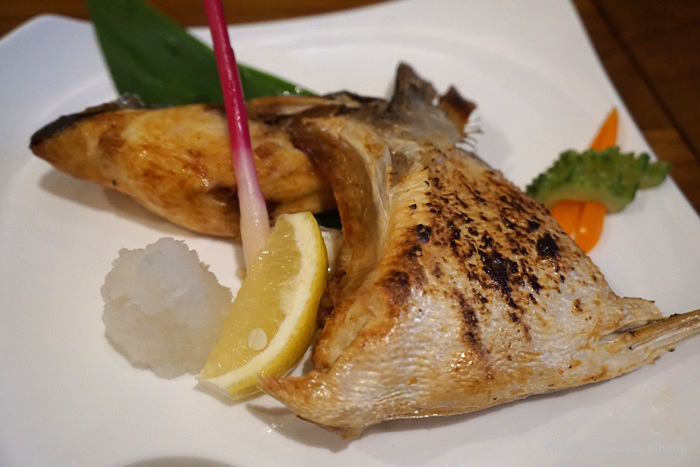 You can’t go wrong with any collar of fish, and we snarfed the grilled yellowtail kama. Theirs is very meaty and flaky, but moist. Local crab miso soup, $9. The local crab miso soup is big enough for two people, so we shared it. 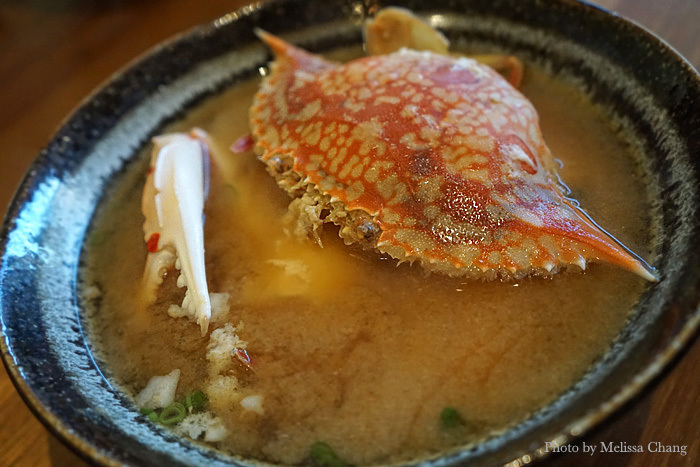 The soup itself is has rich, crabby flavor, and the crab is delicious — if you can get to it. There aren’t any cracking instruments or finger bowls, so getting to the crabmeat can be a messy task. The shell is thin, though, so it’s not too bad. I’d say it’s worth the effort. 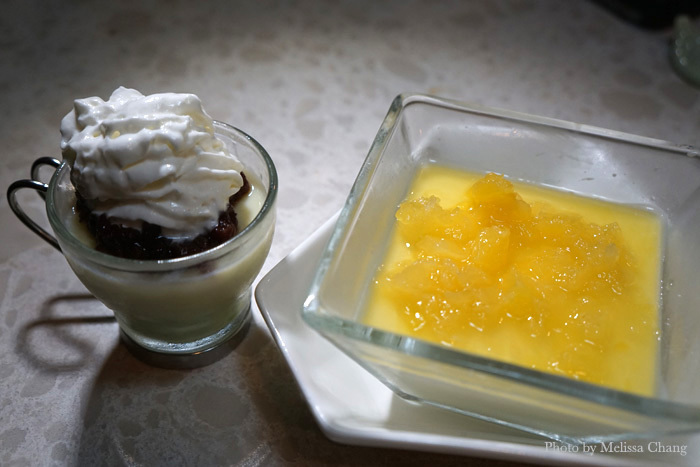 Soy bean pudding, $6.50; pineapple panna cotta, $7. If you still have room for dessert, they do have a few options. We tried the soy bean pudding, which had layers of matcha pudding and something crunchy on the bottom (we’re not sure what, but it was good) and topped with azuki and whipped cream. I liked the pineapple panna cotta, which was lightly rich and slightly sweet, just a nice, simple way to end a meal of such complex flavors. A lot of people asked if it is related to the Bozu that was previously in Kaimuki; as far as we know, it’s not. 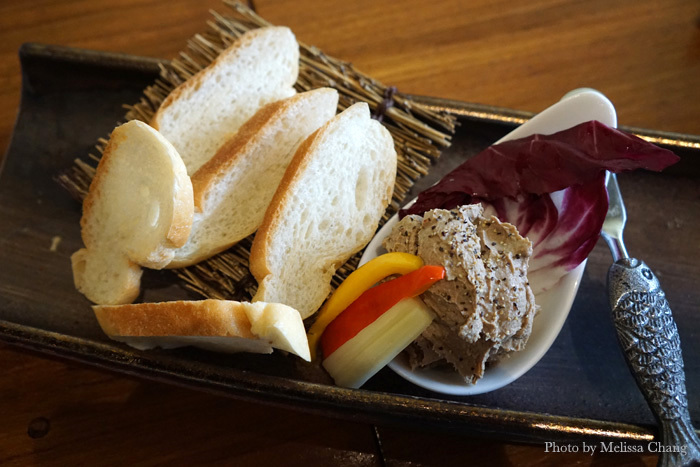 We loved our visits to this McCully izakaya and can’t wait to go back. Be sure to make reservations, as they get really busy, and try to go early. If you speak Japanese, that’s a plus.